We had a really good visit into Pointe a Pitre. The bus trip took nearly 2 hours but we basically got a tour of the north side of the western butterfly wing. AND it was a proper big bus - no little mini van with 19 of our closest friends. Opps sorry. I should explain. 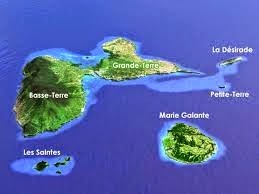 For those that don't know.....and we didn't until we came to the Caribbean and sailed to this island.....Guadeloupe is shaped like a butterfly. The western side is called Basse Terre but it's actually very mountainous with a dormant volcano, National Park and several waterfalls including the highest waterfall in the Caribbean. All things we have not seen but want to. We discovered on our bus ride into Pointe a Pitre that north side of the western butterfly wing is filled with fields of sugar cane. Apparently the eastern butterfly wing, Grand Terre is ironically flatter and very agriculture focused. But again we have not been so we won't know until we go. I found Tom lingering a bit too long in front of places with "A Vendre = For Sale" Rut Row. Pointe a Pitre was wonderful. It's a big city much like Fort de France on Martinique. We like big cities. Being French, Pointe a Pitre and actually Guadeloupe has developed infrastructure that some of the newly independent Caribbean counties (last 50 years is new) just don't have yet. Things take time and money. France and her overseas territories have been around for a very long time.